Hi guys! We're finally approaching the colder months and I'm actually quite excited for Autumn and Winter this year, (mainly to wear my wooly hat again). 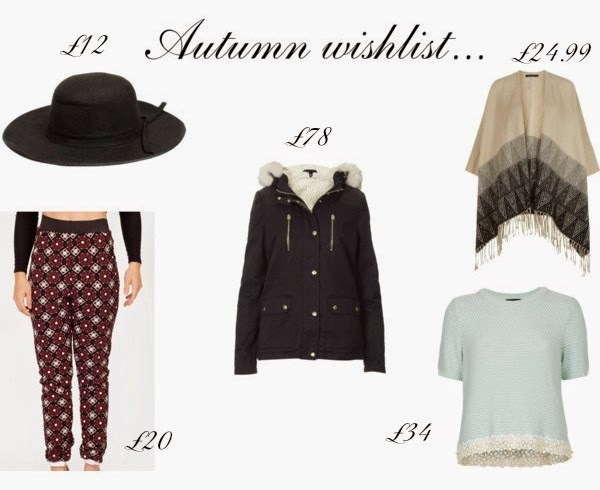 As I've started sixth form now there will unfortunately be a shortage of posts, but as I've had some spare time this evening I thought I would put together some pieces that I would really love for Autumn/Winter this year! The first item is my absolute favourite of them all and it is a black floppy hat from boohoo which is £12. I've seen a couple of people wearing them lately and I think they add a lot to a simple outfit which would be perfect for Autumn. The next item are a pair of trousers from loveclothing.com which is a new brand to me but I love some of the items they sell. These are geo print harem trousers and I love the berry colour included in these and the would be perfect with a plain cream top, ankle boots and the floppy hat (could swap for heels in the evening). The next item is a coat (a fairly expensive one at that) from Topshop. I can't explain to you how much I love this coat, amd if you ask me I think it would be perfect for the colder months even though it''s short because it has the thick faux fur lining and it just looks so cosy! There's another item from Topshop in here as admittedly, I have a bit of an obsession with this shop. As it gets colder I'm going to want to wear cosier, thicker clothing and I love the pale blue colour of this top. I think this is perfect for the transition stage between Summer and Autumn as its thicker than a normal top but it's still incorparating the pale blue colour that you would normally wear in Summer and the lace trim. The last item on my Autumn wishlist is quite unusual for me as I wouldn't really wear this kind of thing, however I really like the idea of it. It's a cream chervon tassel hem blanket wrap from New Look, and you wear as sort of a cardigan but it's much baggier. It just like the idea of being able to walk around basically wearing a blanket around me and calling it a cardigan haha.